Passion fruit is among the most competitive fruits in Kenya with a great economic importance. Sweet yellow passion fruit is newly released in Kenya. Sweet yellow passion fruit has high demand from the juice makers as it yields more juice than the purple passion fruit. There are two main types of passion fruits; yellow and purple. The sweet yellow passion fruit could soon overtake the once black gold of coffee if more farmers embrace its production in the country. Its farm gate price stands at Sh 70 per kilogram during the peak while those lucky farmers who produce the commodity at off peak can comfortably earn Sh 120 per kilogram. Mostly, passion fruit is round or oval, 4-6cm diameters. Vines commence cropping at 6 months of age and reach full bearing in 18 months. The vines have a productive life of 3 to 4 years. New plantings should be made on a continuous 3 year rotation to maintain production. Passion fruit grows well in cooler temperatures at an elevation of between 1200m-1800m above sea level east of the Rift Valley and up to 2000m above sea level west of the Rift valley. More specifically, the purple passion fruit does well in the upper midland to upper highland zones (1200-1800m) while as the yellow passion fruit does well in the lower midland to lower lowland zones (up to 1200m). Further, the fruit does well in optimum temperatures, where the production of purple and yellow passion is between temperatures of 18-25 degrees Celsius and 25-30 degrees Celsius respectively. To improve the profitability of yellow passion fruit cultivation, the development of technologies to increase yield productivity, especially those pertaining to the mineral nutrition and irrigation and fertilization is essential. poor post-harvest handling due to lack of skills and capacity to maintain good post-harvest quality; pests and diseases, particularly die back disease. Smallholder farmers in Kenya begun growing passion fruit as a result of the support gained from the Kenyan government, private foundations and bilateral and multilateral donors since the early 2000s. The gross value of an acre of passion fruit with a good harvest was estimated to be Ksh. 600,000 ($8,000), or 12 times as much as that of maize at the time. Yellow passion fruit production has led to farmers earning sh. 10,000,000 in Meru County through a project initiated by Techno serve an NGO whose primary goal was to encourage farmers to produce more mangoes and yellow passion fruits which can access international markets with required residue levels. 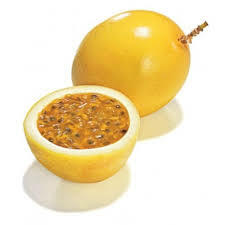 Yellow passion fruit farmers have realized higher profits due to lower growing costs since the purple passion fruit requires spraying six times each fruit season, compared to three times a season for the yellow variety. The new variety has doubled fruit incomes, with industrial fruit processors opting for the yellow passion fruit over the purple passion fruit because it is sweeter, less acidic and bigger with more juice.